After the U.S.-led military alliance ejected Saddam Hussein’s forces from Kuwait in 1991, the Kuwaitis "never paid us." 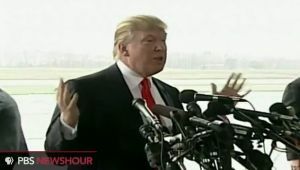 By Louis Jacobson on Wednesday, April 27th, 2011 at 6:16 p.m.
During an April 27, 2011, news conference in Portsmouth, N.H., Donald Trump -- the businessman and potential Republican presidential candidate -- was asked what he would do differently from President Barack Obama. "What I would do differently is come down really hard on OPEC," Trump said, referring to the cartel of oil-producing states, including many in the Middle East, which are behind the recent rise in gasoline prices. "If you look at these nations, they wouldn't be there except for us. You take a look at Kuwait. I mean, we handed Kuwait back to the people that right now essentially own Kuwait, because it's really ownership more than anything else. We handed it back. They never paid us." Trump was referring to the Persian Gulf War in 1991, when a U.S.-led military alliance drove Saddam Hussein out of Kuwait after the Iraqi dictator invaded the small, wealthy, oil-producing emirate. Is it really true that Kuwait didn’t bother paying us back after we bailed them out? Not at all. We turned to the final report on the war presented to Congress in 1992. According to the report, the U.S. was on the hook for the cost of more than 500,000 U.S. troops and associated equipment beyond what the military would have had to pay for ordinary, non-war activities. But rather than shouldering this burden alone, the administration of President George H.W. Bush secured financial pledges from fellow coalition members. The report says that these war costs, known as "incremental costs," were estimated to be $61 billion. In 1990 and 1991, coalition nations committed almost $54 billion to offset that cost -- roughly two-thirds from Persian Gulf states directly threatened by the invasion and one-third from other countries, largely Japan and Germany. A final accounting published a decade later by the House Budget Committee’s Democratic staff found that the final reimbursements eventually crept up slightly, to $54.1 billion. Of that, $48.4 billion was in cash, and $5.7 billion was in kind. So Trump was flat wrong that Kuwait "never paid us." When the books were closed on the war, the United States found itself out of pocket by about $7 billion -- less than half of the $16 billion shelled out by the Kuwaitis. We rate his claim Pants on Fire! Published: Wednesday, April 27th, 2011 at 6:16 p.m.